Research in our group aims at the synthesis and identification of small molecule probes for the study of protein function - a strategy which has been called "Chemical Genetics". In this endeavour, which requires the continuous collaboration between biologists and chemists, we pursue two different strategies. On one hand, we develop high-throughput methods for the synthesis of collections of chemical compounds ("libraries") which are screened in phenotypic cell-based assays or against specific proteins. Our second approach aims towards the design of molecular probes to study the mechanism of specific enzymes and the function of these proteins in their cellular environment. These efforts have led to the first inhibitor of PhzA, an enzyme which is essential for the biosynthesis of a bacterial virulence factor of clinical relevance. Other lines of research in our lab encompass the use of transition-metal catalyzed reactions for the post-translational modification of proteins, biocatalysis, and electroorganic synthesis. 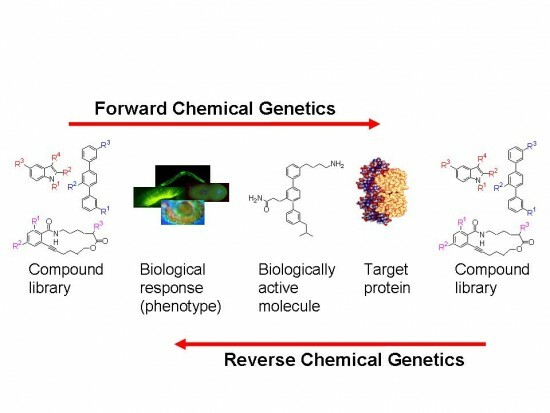 Small molecule screens allow the identification of hit compounds which in an interative process can be refined to tool compounds for chemical genetics - an approach which has complementary advantages over established genetic methods. This process faces three challenges: 1) a screening library of compounds has to be composed of a highly diverse set of chemical structures but which have a proven record of biological relevance , 2) typically compounds identified as hits in high-throughput screening show poor affinity and protein specificity, and therefore have to be refined by medicinal chemistry tools to produce selective protein modulators with nanomolar affinity, and 3) if in a phenotypic screen a hit compound is identified, then the question arises, which protein target is responsible for the interesting phenotype caused by the small molecule hit compound. In collaboration with several biologists we are active in all these three fields. N. Mayer, M. Schweiger, M. Romauch, G. F. Grabner, T. O. Eichmann, E. Fuchs, J. Ivkovic, C. Heier, I. Mrak, A. Lass, G. Höfler, C. Fledelius, R. Zechner, R. Zimmermann*, R. Breinbauer*, Nat. Chem. Biol. 2013, 9, 785-787. M. Peters, M. Trobe, H. Tan, R. Kleinweischede, R. Breinbauer*, Chem. Eur. J. 2013, 19, 2442-2449. M. Peters, M. Trobe, R. Breinbauer*, Chem. Eur. J. 2013, 19, 2450-2456. J. M. Krysiak, J. Kreuzer, P. Macheroux, A. Hermetter, S.A. Sieber*, R. Breinbauer*, Angew. Chem. 2012, 124, 7142 –7147; Angew. Chem. Int. Ed. 2012, 51, 7035-7040. "A New Type of Binding for Chiral Drugs - The Active Site of an Enzyme can Host both Enantiomers of a Racemic Ligand simultaneously"
M. Mentel, W. Blankenfeldt*, R. Breinbauer*, Angew. Chem. 2009, 121, 9248-9251; Angew. Chem. Int. Ed. 2009, 48, 9084-9087. "Polystyrene Sulfonyl Chloride: A Highly Orthogonal Linker Resin for the Synthesis of Nitrogen-Containing Heterocycles"
M. Mentel, A. M. Schmidt, M. Gorray, P. Eilbracht, R. Breinbauer*, Angew. Chem. 2009, 121, 5955-5958; Angew. Chem. Int. Ed. 2009, 48, 5841-5844. "PhzA/B Catalyzes the Formation of the Tricycle in Phenazine Biosynthesis"
E. G. Ahuja, P. Janning, M. Mentel, A. Graebsch, R. Breinbauer, W. Hiller, B. Costisella, L. S. Thomashow, D. V. Mavrodi, W. Blankenfeldt, J. Am. Chem. Soc. 2008, 130, 17053-17061. The toolbox of Organic Synthesis is said to allow the the synthesis of any molecule which exhibits a minimum level of stability. However, any synthetic chemists experiences that for certain applications the available methods are not good enough, and have to improved or new methods have to be invented. J. Ivkovic, C. Lembacher-Fadum, R. Breinbauer*, Org. Biomol. Chem. 2015, 13, 10456-10460. E. Brehm, R. Breinbauer*, Org. Biomol. Chem. 2013, 11, 4750-4756. J. Rentner R. Breinbauer*, Chem. Commun. 2012, 48, 10343-10345.